When you stay at Sunrise Studios Perissa in Santorini, you'll be near the beach, a 1-minute drive from Perissa Beach and 8 minutes from Perivolos Beach. This aparthotel is 6.8 mi (10.9 km) from Athinios Port and 7.1 mi (11.3 km) from Santorini caldera. Make yourself at home in one of the 9 air-conditioned rooms featuring kitchenettes with refrigerators and stovetops. Rooms have private furnished balconies or patios. Complimentary wireless Internet access keeps you connected, and flat-screen televisions are provided for your entertainment. Conveniences include safes and desks, and housekeeping is provided daily. For lunch or dinner, stop by Sirocco, a restaurant that specializes in international cuisine. You can also grab snacks at the coffee shop/café. Wrap up your day with a drink at the bar/lounge. Continental breakfasts are available daily from 8 AM to 11:30 AM for a fee. Featured amenities include limo/town car service, express check-in, and luggage storage. A roundtrip airport shuttle is available for a surcharge. 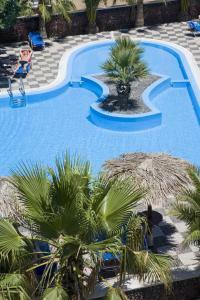 When would you like to stay at Sunrise Studios Perissa ? To make arrangements for check-in please contact the property at least 48 hours before arrival using the information on the booking confirmation. This property offers a roundtrip airport shuttle service for JTR-Santorini National Airport. For more details and check-in instructions, please contact the office using the information on the reservation confirmation received after booking. Each day we'll check prices and send you an email for your selected dates at Sunrise Studios Perissa. If you don't have specific dates but would like to check prices for say next weekend or say next month we can check the price too. Click to write a review and share your experience of Sunrise Studios Perissa with other travellers.